The ruling, he said, was “a message to the government”, which he urged to ban other toxic pesticides that contain glyphosate, used in Monsanto’s top-selling Roundup. “History will judge them for not acting,” he said, referring to a campaign pledge by President Emmanuel Macron to phase out glyphosate in France, which he backed down on last year. The company can still appeal today’s ruling by the Cour de Cassation, a top French appeals court. 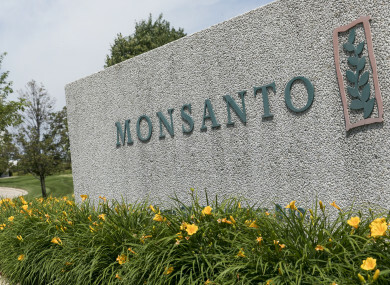 The court in Lyon, southeastern France, rejected the company’s appeal but did not rule on how much Monsanto might have to pay, which will be determined in a separate ruling. It did order the company to pay €50,000 immediately for Francois’s legal fees. Speaking after the verdict, a lawyer for Monsanto France, Jean-Daniel Bretzner, said it would probably appeal, since the ruling applied to Lasso’s producer – in this case, Monsanto Europe. “Supposing that Paul Francois was accidently exposed to Lasso, by definition such exposure is rare,” it said in a statement. This is the latest conviction against Monsanto involving its weedkillers and pesticides, which have been widely used around the world for years. Last month, a San Francisco court ordered the $80 million (€71 million) payout to a retiree who blames its popular Roundup weedkiller, which contains glyphosate, for causing his non-Hodgkin’s lymphoma. It had already been ordered last year to pay $78.5 million (€69.7 million) to a California groundskeeper who attributed his non-Hodgkin’s lymphoma to using Roundup as well as Monsanto’s Ranger Pro. Monsanto denies that Roundup causes cancer. It has challenged findings by the International Agency for Research on Cancer, an arm of the World Health Organization (WHO), which classified glyphosate as a “probable carcinogen” in 2015. Email “French court upholds guilty verdict against Monsanto over poisoning of farmer who used its weedkiller”. Feedback on “French court upholds guilty verdict against Monsanto over poisoning of farmer who used its weedkiller”.